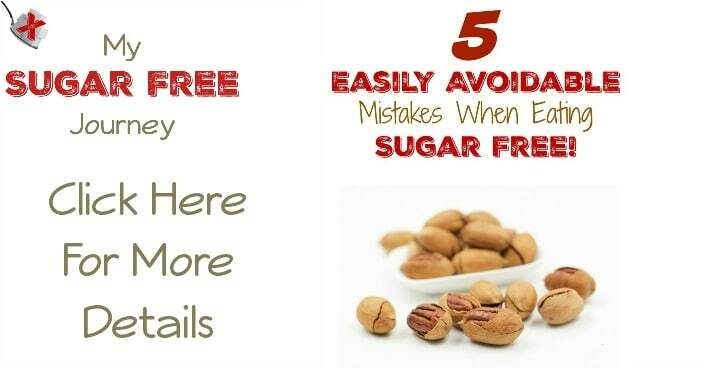 5 Easily Avoidable Mistakes When Eating Sugar Free! Now that I’m about 3 months into my renewed focus on eating sugar free, I wanted to share with you some of the mistakes I made early on that I think really sabotaged my weight loss. Not that I’m not happy with the progress I’ve made, just that things could have gone faster if I had done things a little differently. One of the first things you learn is that when you cut out the sugar and grains and switch over to a high fat diet, you stay satiated longer and don’t struggle with hunger pangs like you used to. Unfortunately, in my case, my relationship with food was so screwed up that I never really gave that a chance to happen. I was eating clean but I was also eating enough for 3 people. In fact, this is still something I struggle with, especially if the food tastes good. For instance, my wife and I went to a BBQ restaurant the other day and I got a 3 meat plate. That’s a 1/2 pound each of 3 different types of BBQ. Considering that a serving of meat is about 4 oz, I packed away enough meat for 6 people in about 10 minutes. Sometimes I think my stomach is working against me as I’ve felt hunger pangs IMMEDIATELY after eating dinner. That shouldn’t even be possible! But I just drank some water and waited for the pang to subside. Or at lest that’s what I should do, sometimes go back for seconds. But I’m working on it. I’m convinced that health food is the worst thing in the world to eat. For instance, Larabar is running a series of commercials touting how their food is made from food. What they don’t tell you is the “all natural fruit” their bars contain has been processed so all the fiber has been removed and all that’s left is the sugar. If you want to eat healthy, stay away from “healthy” food and stick with whole food. You want something that tasted like an apple? Eat an apple. Yes there is a small amount of fructose in fruit but there is so much fiber and other vitamins that the effect of the sugar on your body is negligible. Plus, it’s hard to eat more than 1 or 2 pieces of fruit at a time so it’s hard to over eat. Or avoid fruit all together and have a turkey lettuce wrap. Cheese has no sugar so cheese can be eaten with impunity, right? Well I was having some issues with weight loss and one book I was reading (I can’t remember which one it was. Perhaps Vinnie Tortorich’s book, Fitness Confidential) suggested that if you are cutting the carbs and not seeing the weight loss you want, cut back on the cheese. So I tried that and low and behold it worked. So my wife Dian was chomping down on some almonds one night and her mother walked in and started talking to her. After saying whatever she needed to say, she asked why Dian was eating the almonds when she is trying to lose weight. Dian explained that since they contained no sugar or carbs, we could eat them. Now my Mother in Law is a country girl from way back who grew up on the shady side of the mountain way back in the Tennessee hills. I mean up in the holler, down on the farm, near the coal mines. She kind of looked sideways at Dian and told her she would never lose weight that way because almonds were what they used to feed the hogs to fatten them up before the slaughter. Just like cheese, even if it’s allowed on our diet, it’s possible to eat too much of it. Even if you are eating the cleanest whole food diet in the world, if you are eating too much, you won’t see the results you want. In fact, I had to get a tiny little bowl and scoop some mixed nuts out of the canister just to be sure I wasn’t over eating at night. I don’t recommend anyone just stop eating sweet things cold-turkey. Sugar substitutes are fantastic training wheels but your goal should be to slowly ween yourself off them entirely. I didn’t realize when I started this Sugar Free Journey, but it’s not just my addiction to sugar that needed to go, it was also my addiction to sweet. My main areas of weakness was my drinks. I wanted sweet coffee in the morning, a Coke with lunch and a sweet tea with dinner. I tackled the coffee first and quickly got to the point where a splash of milk is sweet enough. March 1st I decided that I had drank my last Coke Zero and that’s going well. Now the last thing I need to handle is the Sweet n Low I put in my tea at night. Once that’s gone, I’ll be free from the tyranny of sweet. 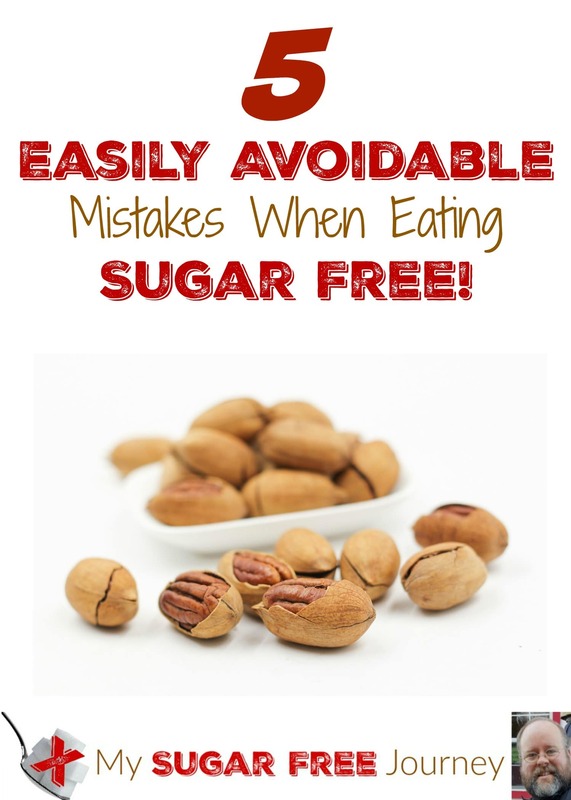 So that’s it, all the easily avoidable mistakes of the sugar free lifestyle. 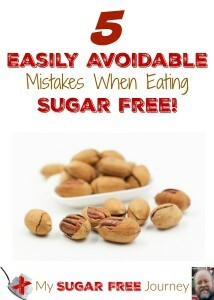 I hope this makes your sugar free journey a little easier. Have you decided to cut out the sugar? I would love to hear from you! Please feel free to reach out and let’s work together on this! NEXT POST Next post: 3 Must Have Spices for Sugar Free Cooking!